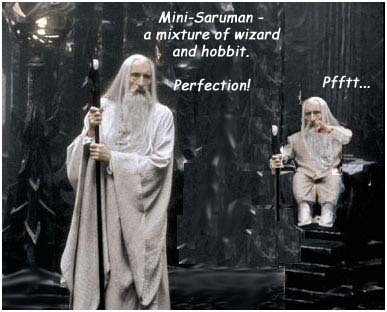 When I first read The Lord of the Rings I thought it was simple. Of course �owyn killed him, after all, she was the one that put the sword between his crown and mantle. Sure, Merry poked him in the back of the knee. So? He gave the Witch-king a limp for a while, he'd get over it. Then I was shown that it was a bit more complicated than that. Sure, �owyn's sword ended up in the Witch-king's face, which will put a stop on anyone's day, but Merry had a N�menorean blade, and more importantly, a blade of the North-kingdom--the chief enemy of which was the dread realm of Angmar, ruled by the Witch-king--which was made partly with magic (call it what you will, Merry would call it magic) against that realm and that king. I quote: "So passed the sword of the Barrow-downs, work of the Westernesse. But glad would he have been to know its fate who wrought it slowly long ago in the North-kingdom when the D�nedain were young, and chief among their foes was the dread realm of Angmar and its sorcerer king. No other blade, though mightier hands had wielded it, would have dealt that foe a wound so bitter, cleaving the undead flesh, breaking the spell that knit his undead sinews to his will." I didn't notice that the first time. So obviously Merry's blow allowed �owyn to kill the Witch-king, and kept her from being smashed to bits by his mace, which is always a plus, let me tell you. Being saved, that is. Being smashed is no fun at all. But it was �owyn that actually killed him. A side note that goes along with this is the Witch-king's "prophecy". Some have said that �owyn, being a woman, and Merry, being a hobbit, were the only two on the Pelennor that could have had anything to do with killing the Witch-king. Personally, I [ disagree ]. If you lived more than a millennium and were still a very high ranking person, and were invisible, you would think you were hot stuff too. Anyone there could have killed him. After Merry poked him, of course. In conclusion, �owyn killed the Witch-king, just like I always thought, but only with a good deal of help from Merry, which I didn't pick up on the first time. And the Witch-king is full of himself.